We know from our own memories that children LOVE the freedom of outdoor play and we know from our experience as childcare professionals that this can lead to some brilliant social development and learning experiences. Outdoor play is not just about physical development, it is SO important for other areas of learning too. When children are given the freedom and space to physically move they begin developing more than just their muscles. Many of our neurological systems need movement in order to develop. Physical play is not just fun, it actually boosts your ability to learn. But, as Practitioners, we need to carefully manage and record child learning whilst outdoors. 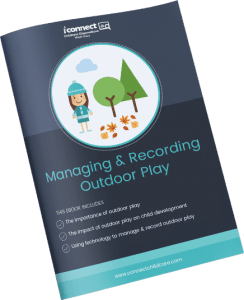 Download this free eBook to find out about the importance of outdoor play and how you can use technology to manage it in your setting. We are so proud to be GOLD sponsors of Kathy Brodie’s free web summit. Have you registered for it yet? It’s a fantastic opportunity for some free, easily accessible CPD. This Summit is focused on strategies and top tips to support, challenge, improve and understand Children’s Outdoor Play and Learning. Kathy invites top experts, from around the world, to talk about everything from good outdoor design to nature pedagogy to going on expeditions outdoors with children.